- Isis, Astarte, Diana, Hecate, Demeter, Kali, Inanna — Her names are many, but at the core, She is the divine feminine, the Great Mother — the Goddess. 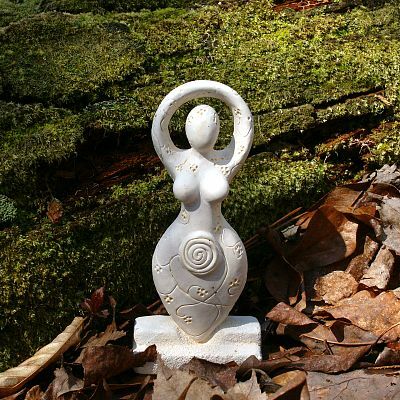 For pagans and wiccans alike, the Spring Goddess Statuette is an excellent representation of the Goddess for your altar or ritual space. Although She stands only 5 1/2" tall, She fairly radiates with strength and love. Spiraling outward from her center, vines and flowers spring forth, and celebrate the turn of the seasons, and the return of life to the world. The picture doesn't show it well, but there is just a dusting of gold that adds highlights to the ivory colored statue. The statuette has a flat back, so that, if you prefer, if can be displayed hanging on a wall rather than standing. 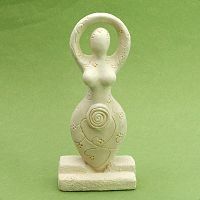 The Spring Goddess Statuette has been a long-established part of our catalog, and is always a customer favorite. It's easy to see why! Can my Goddess figure be displayed outdoors? Indoors only, please. The statuette is made of gypsum cement. Although it is quite durable, the elements will take their toll over time. Do you have a matching figure for the God? Not at this time. We hope to find the perfect counterpart to this statue eventually, but until then, the Goddess stands alone. 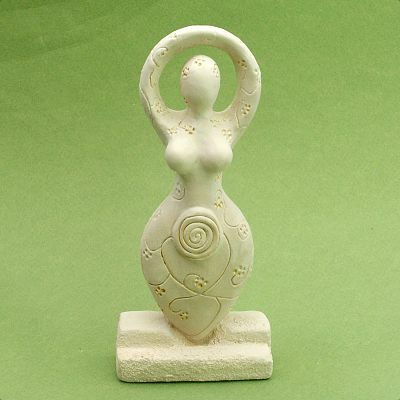 Do you have any other questions about our Spring Goddess Statuette? I bought this with the intention of giving it as a gift. When she arrived, (only 2 days after I placed an order!!!) I couldn't bear to let her go. She is even more beautiful than pictured! Great quality in the simplicity of her understated design. Her 5 1/2" size commands the awe of a something larger! Absolutely wonderful! I loved Her from the first sight of Her. 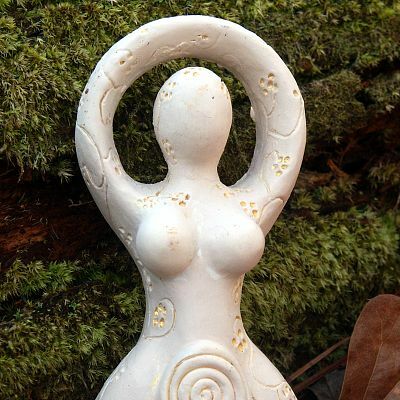 I often found that Goddess statues did not pay honor nor tribute to the beauty of the Goddess until I saw this one. I chose this one for my altar and it's just perfect. It's lovely and strong, beautiful yet simple and when I look at it sometimes it feels like some of the mysteries unveil themselves and things get clearer. I just received this statue today and she is just as beautiful as I'd hoped. The gold wash is very subtle, which is nice, not gaudy. She's absolutely perfect for my altar. Beautiful statue! Perfect for any alter or home! I love mine! this was a perfect addition to my alter. It is great size, great price and very sturdy.